Our March 2018 Monthly Rewards Recap is now available to read and download. Electronics are still taking the lead in redemptions, with tablets and wireless headphones dominating the highest-ranking categories right now. Get a glimpse of the new additions to our awards collection. 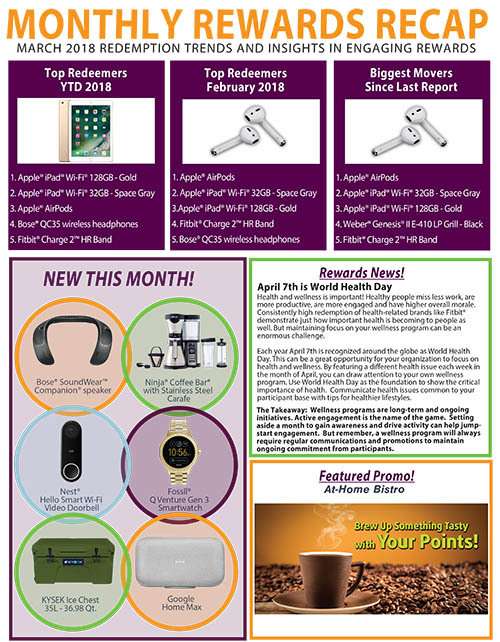 This month’s new items showcase a variety of smart devices to update homes for the spring season including the Nest® Hello Smart Wifi Video Doorbell and the Coffee Bar® with Stainless Steel Carafe. In our news section, gain some insights on how to help your organization focus on health and wellness. With World Health Day on April 7th, it will be a great time to communicate tips and practices for a healthier lifestyle. Click on the image below to open the March issue as a PDF in a new window. Contact our team to learn how we can assist with your incentive, reward and recognition needs. Subscribe to our blog to get updates on incentives news, trends, rewards and more.